Every time I sit down for a Commercial Break I struggle with the introduction, yes, this part right here. Ironically, I have the rest of the post mapped out, categorized to a point where I simply can’t stumble on the scary question: what should I write about. That’s why today this part of the post sounds like I’m saying something while it’s not saying anything. On Sunday I spent 4,5 hours cleaning my room and it’s now spotless! This is a great victory considering the fact that I have too many things, and a really small room, so it was about time I’d organize the junk. Monday was a little less eventful, but on Tuesday I went to my first physiotherapy session. It was.. interesting. Though I don’t necessarily have lower back issues but since I have pulled it twice this year, I decided to go for a check-up type session and he did find some small issues. During this 1 hour session he apparently shifted everything into place, and through some weird bendy-bendy stuff, said that one of my discs was now able to move again. So that sounds awesome, and I slightly feel the difference already. Monday was a movie day and I went to see The Man From U.N.C.L.E which I loved. Yes, despite the lack of buzz and the mediocre expectations, I’m still a Guy Ritchie fan and I can’t help it. There will most likely be a review up soon.. a review or a really long love letter to Armie Hammer, either way, I’m going to have fun writing it. Though the movie has Henry Cavill aka Superman, I was more interested in Armie Hammer throughout. Not just because the script seemed to highlight his character a lot more, but because, and don’t hate me, I don’t find Cavill that attractive. I don’t know why and it’s not that I don’t like him at all, it’s just that when it’s between Cavill and Hammer, I’d choose Hammer always! Saw the trailer for Sicaro and it looked awesome! And Emily Blunt looked amazing as usual. The new Black Mass trailer is pretty good too, it has a sort of The Departed vibe with Joel Edgerton being a dirty agent and all, plus, it has been getting really great reviews. Watched one episode of Hannibal and then sort of left it at that. Just wasn’t feeling it, just like I didn’t really get into the mood with it before. I’ll continue with it though, sometime this year. Though I need to finish with Mr. Robot first and then I’ll think about going forward with Hannibal. Also watched Sneaky Pete‘s pilot, which is an Amazon series with Giovanni Ribisi and Bryan Cranston guest stars as well. It looks promising, and hopefully Amazon will continue with it and not throw it away like they did with The After. I friend pointed out that I should also watch Narcos and I agree, because Pedro Pascal and Netflix. When I’ll be able to watch it, who knows. Currently on my nightstand is a book called Dante and Aristotle Discover the Secrets of the Universe, and it has the best dialog writing I have seen in a while. It flows so well and it’s so natural, and though I already see where this book is going to go, I’m also certain I’ll love it. Music wise, Wild by Troye Sivan has been on repeat for two days. I’m so proud of that kid, Youtuber turned into a singer/songwriter and I must place emphasis on the word songwriter. The whole art concept of the album, the creativeness behind it just makes me happy. Plus, as a bonus, the video for Wild (part 1 of a trilogy) is simply gorgeous. If you haven’t yet, check the kid out, his career is definitely on the rise. Rambling Film reveals her thoughts about The Diary of a Teenage Girl. Two Dollar Cinema talks about two men walking around.. in other words, A Walk in the Woods. Cinematic Corner shares her favorite scene from Mad Max: Fury Road. And a selection of reviews including Straight Outta Compton in Abbiosbiston’s Film Friday. Absolutely! 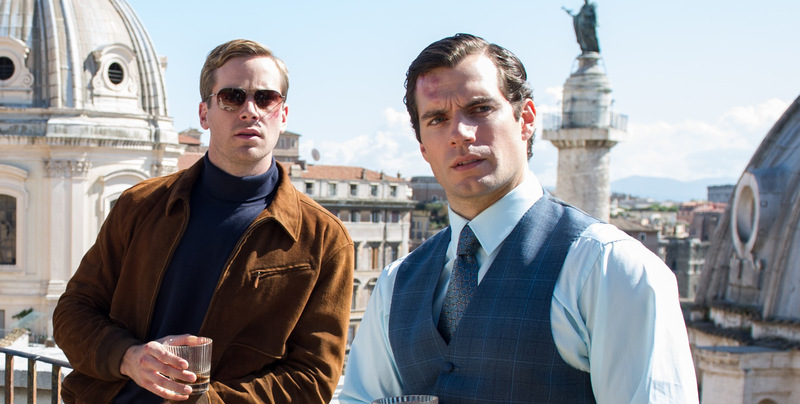 I know a lot of people who went into The Man from UNCLE with no sense of humour and consequently didn’t like it, but I thought it was absolutely hilarious. My friend and I laughed throughout the entire thing. It was luckily a bit lighter than I was anticipating so it was a delightful surprise I actually ended up liking it as much as I did. I purposely went in with medium to low expectations and then ended up loving it. So I am super happy with the movie. Oh yeah and on another note: Did you know that Armie Hammer and his wife have their own bakery/cupcake shop? I think that’s so awesome! Thanks so much for the link! Still didn’t see UNKLE but glad to read it’s fun! It was fun! I mean, it was surprisingly fun! Thanks for the shout out! Glad the physio is helping!